MORRIS, Ill. (WLS) -- The Morris City Council unanimously passed a raffle ordinance Tuesday night, which would allow the Morris VFW's $1.6 million Queen of Hearts raffle to go forward. Thousands of raffle tickets for a drawing planned for late August, but it was suspended due to a 2015 rule requiring it obtain a license. It was suspended indefinitely pending this city council vote. The ordinance requires a ten-day period of publication, so the earliest the southwest suburb can issue a raffle licensed in Monday, Sept. 18. 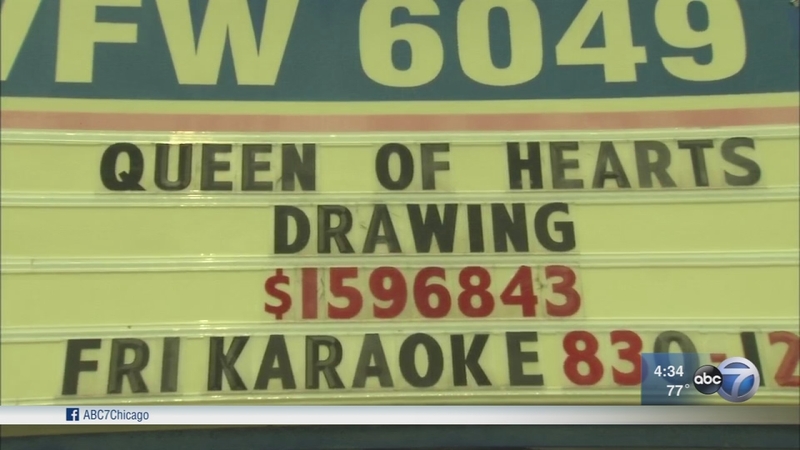 In the weeks leading up to the drawing, lines for tickets got longer as the elusive "Queen of Hearts" had failed to come up at the weekly drawings. With just three cards left, the suspended drawing was to be the last and a winner finally picked. As part of the game, people buy tickets and then choose a number on a chart. If the queen of hearts is behind their number, the person gets 70 percent of ticket sales.